Founded in 1994 by Gilles Dyan, a member of the European Chamber of Expert Advisors in Fine Art, Opera Gallery Group is internationally established, with 12 galleries around the world. It has become one of the rare international art gallery networks with locations in four regions: North America (New York, Miami, Aspen), Europe (London, Paris, Monaco, Geneva), Asia (Singapore, Seoul, Hong Kong), and the Middle East (Beirut, Dubai). Each gallery in the group is an educational feast, offering an enlightened view of where the great masters and today’s emerging talents meet. 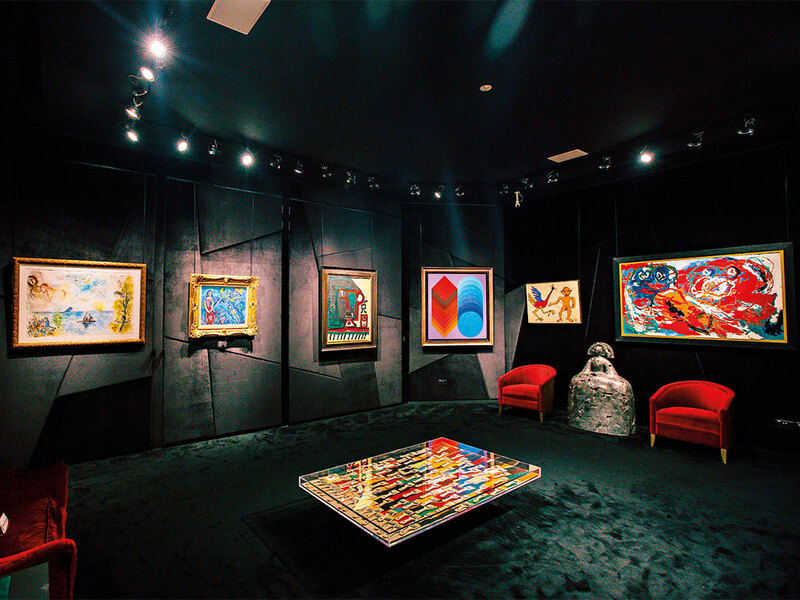 The gallery exhibits remarkable works by masters of modern art, such as Pablo Picasso, Fernand Léger, Henri Matisse, Jean Dubuffet, Lucio Fontana, Alexander Calder and Andy Warhol, as well as iconic contemporary artists, such as Manolo Valdés, Yue Minjun, Yayoi Kusama and Pierre Soulages. It has also played a major role in enhancing the international recognition of Bernard Buffet and André Brasilier’s work. Moreover, the gallery has developed several specialised departments, covering such areas as Asian art, street art, photography, design, and Latin American art. Thanks to Gilles Dyan’s innovative approach and unique insight, the gallery has become an incubator, where emerging and established artists coexist. Under his direction, the collection has grown to include over 100 international artists, turning Opera Gallery into one of the world’s most diverse and eclectic collections. European CEO spoke to Dyan about the company’s growth, its ambitions for the future, and the state of modern art today. Opera Gallery’s most recent development focuses on increasing our presence in the US. We have relocated to New York and Miami, and we have opened a new branch in Aspen. In New York, we used to be in SoHo, but we reopened in a bigger and more luxurious gallery on Madison Avenue in 2016. In Miami, we have moved from Bal Harbour to the new Miami Design District. Our approach relies on a considered strategy to be situated in the trendy, high-end luxury areas of the world’s biggest cities. The business idea is to source a wide base of clients with high available income, and advise them to help them become confident art collectors. I started in the art world at age 25, selling prints door to door. I had a taste for art and the art market already, but had no idea it would end up being my whole life. Gradually, I identified a gap in the commercial art gallery market – there were no easily accessible galleries selling high-value masterpieces as well as more affordable ‘entry level’ contemporary art. Walking into an art gallery can be a daunting experience for the new or aspiring collector, and I wanted to create a gallery that was open, welcoming and stress-free for such buyers. I created Opera Gallery in Singapore in 1994. I didn’t know the city well, but I was invited to have a stand at an art fair there, and it worked out really well for me. So, three months later I opened my first gallery there. It took off and was followed by a Parisian branch the same year. Now, almost 22 years later, Opera Gallery has 12 branches and employs close to 150 people worldwide. How do you decide which artists to work with? The first artist I ever signed and represented was Spanish painter Lita Cabellut. She is an amazing person and a fascinating artist. Her large-scale portraits convey all the strength and willpower that lie within humankind. I am proud to still be working with her and to showcase her works in several solo exhibitions every year throughout our network. Nowadays, we select new artists in accordance with the taste of our directors and my taste too of course, but also bearing in mind that they must be able to be appreciated and distributed. We take the risk of buying our works – not just stocking them like some galleries do – so each purchase must be a business decision as well as an emotional one. Opera Gallery’s concept is to remain quite non-specific in terms of what we offer, covering the whole of the 20th century up until the beginning of the 21st century. On the secondary market, our offer ranges from the impressionists to American pop artists, with works by Monet, Picasso and Chagall, as well as major post-war movements. We also sell contemporary art, both by up-and-coming artists and by those established artists that we have under contract. Our gallery displays combine these contemporary artists with modern masterpieces, so everyone has a chance to see something to their liking. Price-wise, too, we want to be an art gallery where people can find works from around €10,000 up to €10m, in a space that is easily accessible and visible. What is the origin of the name Opera Gallery? ‘Opera’ is the Latin word for artwork, so Opera Gallery literally means ‘gallery of works of art’. I also chose opera as a word that is easy to understand and pronounce in most languages, and easy to remember too – an imperative for a brand with a strong presence across the globe. Can you expand on Opera Gallery’s focus on cross-cultural exhibitions? One of the challenges faced by an art dealer is the necessity of sourcing good art and being the first one to find tomorrow’s sellable artists, especially if you want to deal on the primary market. With its wide and international network of galleries, Opera Gallery gets access to contemporary art everywhere in the world, giving artists a chance to showcase and sell their works, first locally and later on a wider scale. This means we are able to exhibit South Korean contemporary art in Paris, British contemporary art in Hong Kong, and French street art in Dubai, giving our worldwide collectors access to a great diversity of genres and styles. Recently, we were very proud to collaborate with French-Moroccan artist Yasmina Alaoui. We exhibited her recent works in Paris in October and it was a real success. She has recently started to explore new artistic horizons, producing large framed works evoking vast mineralogical landscapes that are very impressive. Do you encourage collectors to buy work from local artists as well as international ones? Absolutely – it is at the centre of our activity. Opera Gallery aspires to be as much an actor within the local scene as an influencer on the international scene. Every gallery in the group is encouraged to source artists locally and share their work with the other branches. Additionally, in growing markets especially, it is rare for art buyers to collect modern masterpieces first. They will often buy a piece of contemporary art by a local artist, either because they can relate to the style or because they know the name, or even because it has been recommended to them by a friend, and of course because it is more affordable and therefore a lower risk in terms of investment. Later, as we build a relationship with the buyers and present new types of art to them, they can broaden their views and start collecting international art, both contemporary and modern. It is a fantastic journey for a dealer to advise a novice art lover and witness them becoming a knowledgeable art collector. Is there an artist you’ve encountered for the first time recently whose work has had a particular impact on you? I am proud to show the work of young and talented painters like Andy Denzler. In England, I also made a fabulous discovery with painter David Whittaker; collectors will be amazed to discover such a genuine and pure artist. I have also met young French artist Yassine Mekhnache who creates bridges between the art of embroidery and abstract expressionism. His visionary paintings are inspiring. I can also mention an Italian artist whose work has really been inspirational for me lately, though I have encountered him before: Umberto Mariani. Working alongside the Spatialist movement, he started to use abstraction after the Second World War because he thought that representation no longer seemed to provide answers to the world’s savagery. Using materials such as lead and sand, he puts into perspective the way shadow and light play out on canvas. His works absorb and refract light in a way that I find deeply moving. What’s next for Opera Gallery? We are aiming to pursue our American expansion with a project to open a gallery on the west coast, and we’ll be opening a branch in Doha, Qatar around the same time. Of course, we will also continue to source the highest quality of masterpieces and the most exciting contemporary art pieces for our art collectors worldwide.